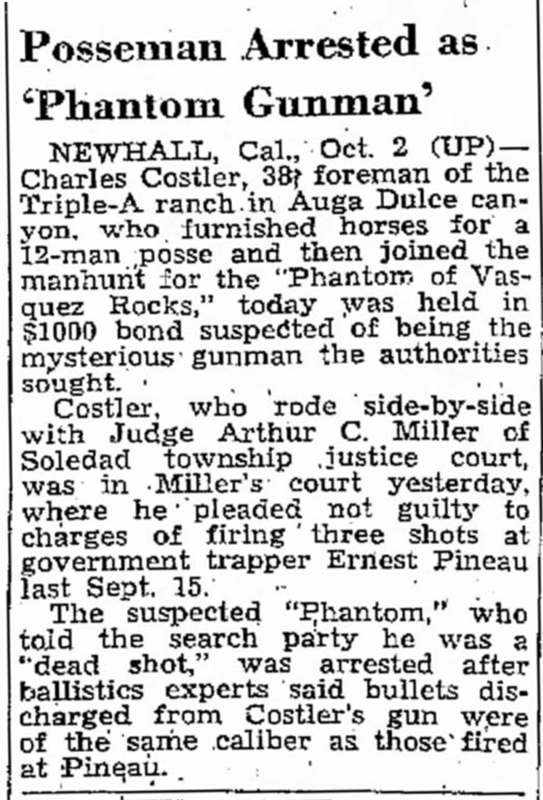 SCVHistory.com | Agua Dulce | Cattle-Rustling 'Phantom of Vasquez Rocks' Captured, 1945. Newsweek article courtesy of Sarah Brewer Thompson; Ogden Standard-Examiner courtesy of Lauren Parker. Original Newsweek caption: "Riding into a California canyon, the sheriff's posse is led by none other than the 'phantom' suspect himself (arrow)." Photo: Associated Press. Click to enlarge. NEWHALL, Cal., Oct. 2 (UP) — Charles Costler, 38, foreman of the Triple-A ranch in Agua Dulce canyon, who furnished horses for a 12-man posse and then joined the manhunt for the "Phantom of Vasquez Rocks," today was held in $1,000 bond suspected of being the mysterious gunman the authorities sought. Costler, who rode side-by-side with Judge Arthur C. Miller of Soledad township justice court, was in Miller's court yesterday, where he pleaded not guilty to charges of firing three shots at government trapper Ernest Pineau last Sept. 15. The suspected "Phantom," who told the search party he was a "dead shot," was arrested after ballistics experts said bullets discharged from Costler's gun were of the same caliber as those fired at Pineau. The three A's of the Triple A Ranch are Jefferson Asher and sons Jefferson Jr. and Thomas. The Ashers acquired the property in the 1930s. In August 1970, the two boys donated 40 acres of the ranch to the County of Los Angeles to form the nucleus of Vasquez Rocks Natural Area Park. It has been growing ever since, encompassing 932 acres as of 2014. In the sheriff's office at Newhall, Calif., one day last month, Capt. Ambrose Stewart made speedy arrangements with Detective Sgt. Charles E. Kelley for an old-fashioned western manhunt. Early that morning as Ernest Pineau, elderly government trapper of mountain lions and coyotes, was stowing his gear in to a truck behind his ranch house 25 miles to the east, someone hidden in the underbrush 250 feet away fired three .22-caliber rifle shots at him, one barely missing his head. Pineau picked up a rifle and trailed the sniper a mile to a cave. As Pineau crawled under a fence, a voice from the cave boomed: "OK, Buddy, you can stand up now." Then the sniper, with hat pulled low over his eyes, covered Pineau with a gun and announced he was going to kill him. Later, relenting, he allowed Pineau to leave on condition that he would not try to identify him and would drop his rifle. Pineau was dead certain he was dealing with a desperado. He notified county police. Hi-Yo Silver: Nearing Pineau's ranch next day, a posse halted in Agua Dulce Canyon where the Triple A Ranch of Jefferson W. Asher, wealthy Los Angeles attorney. To run the ranch, complete with swimming pool and fine cattle, Asher six months ago had hired a new foreman, Charles Costler, 38, a hearty, aggressive man, 6 feet 3 inches tall and weighing 215 pounds, soon dubbed the "Lone Ranger" by neighbors. Now, Costler volunteered to join the posse. As the posse rode away into a valley ringed with massive formations of slate, the hulking foreman was in the lead armed with one of Asher's .22-caliber rifles. As they rode, he talked. He talked so much, indeed, that the officers wondered. The search was fruitless. Costler apparently had been butchering his employer's cattle and hogs for the black market (Asher reported $1,500 worth of livestock and poultry missing). Believing Pineau had detected him by accident, Costler tried to kill him. Last week, unable to raise bail, Costler was jailed, charged with passing bad checks and assault with a deadly weapon. Newsweek magazine number purchased 2014 by Leon Worden.